Shortlisted for the Royal Historical Society's Whitfield Prize, 2014<br /><br /> King Charles I's execution in January 1649 marked a moment of deliverance for the victors in the Wars of the Three Kingdoms, but for thousands of Royalists it signaled the onset of more than a decade of penury and disillusionment in exile. Driven by an enduring allegiance to the Stuart dynasty, now personified in the young King Charles II, Royalists took up residence among the courts, armies, and cities of Continental Europe, clinging to hopes of restoration and the solace of their companions as the need to survive threatened to erode the foundations of their beliefs.<br /> <i>The King's Irishmen</i> vividly illustrates the experience of these exiles during the course of the 1650s, revealing complex issues of identity and allegiance often obscured by the shadow of the Civil Wars. 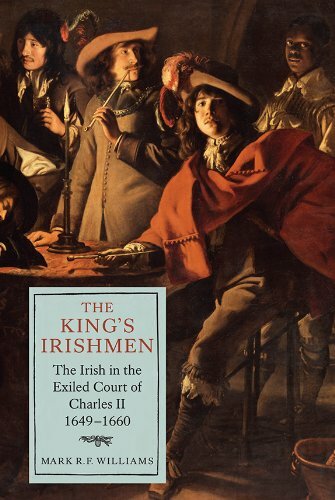 Drawing on sources from across Britain, Ireland, and Continental Europe, it looks at key Irish figures and networks in Charles II's court-in-exile in order to examine broader themes of memory, belief, honour, identity, community, dislocation and disillusionment. Each chapter builds upon and challenges recent historical interest in royalism, providing new insights into the ways in which allegiances and identities were re-fashioned and re-evaluated as the exiles moved across Europe in pursuit of aid. <i>The King's Irishmen</i> offers not only a vital reappraisal of the nature of royalism within its Irish and European dimensions but also the nature of 'Irishness' and early modern community at large.<br /><br /> MARK WILLIAMS is Lecturer in Early Modern History at Cardiff University.